To say Chase Utley is having a rough go of it this postseason would be, well, an understatement. After Thursday’s 1-for-4 in the Phillies’ pivotal Game 5 victory, Utley is hitting just .200/.286/.300 in the 2010 playoffs. His lone extra-base hit was a solo home run in Game 2 of the NLDS against Cincinnati, and all of this goes without mentioning Chase’s normally stellar defense has now taken a turn for the quaky. Suffice to say, Chase’s lack of production is concerning. We’ll leave speculation as to any potential lingering health issues for those more expert in diagnosing such things, and instead look at what makes this 2010 postseason so different for Chase. Respect once again to the crew at Baseball Analytics for their superb analytical tool and the production of these super spiffy graphics. But before we get to the eye candy, a straight-up look at Utley’s slash stats for the 2008, 2009 and 2010-to-date playoffs. Obviously, Chase is at a full series’ worth of games’ disadvantage on ’08 and ’09, and none of these is fully representative of The Man. But this goes beyond the numbers (which are still concerning, small sample and all), because something about Chase just seems off. Well, it does to me, at least. The first red flag is Chase’s diminished slugging, sitting at a tidy, robust .300, piggybacking on the regular season, when Chase posted a .445 SLG, lowest since his rookie year. Let’s take a look at some of those pretty heat maps now, eh? 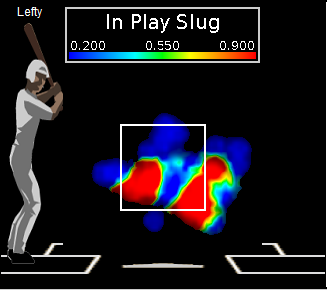 These are Utley’s SLG on balls in play by pitch location in the postseason. There are a couple of interesting things to note here. 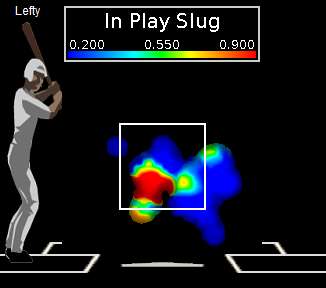 As 2008 and 2009’s maps show us, Chase cared very little for pitchers trying to paint the outside corner. 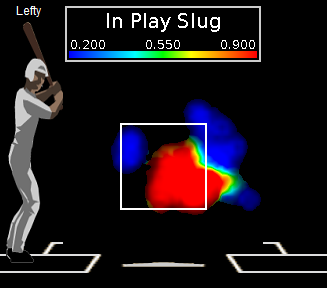 From the outer third of the plate to the furthest extent of Utley’s balls in play, Chase slugged .560 and .938 in 2008 and 2009, respectively. In 2010, that number plummets to .188, reestablishing the outer edge of the plate as a zone of attack for opposing pitchers. Chase it still putting those outside pitches in play, but is barely inflicting any damage. The Phillies have gotten this far by way of their pitching muscle and a few timely hits, but they’re going to need their franchise second baseman to step up if they want to keep playing. Disclaimer: I am not advocating trading Chase Utley in any way, shape or form, as a notable radio host seems to advocate considering. That’s lunacy. Just dissecting a cold streak, that’s all. Also, photo of Chase via the AP.